April 21 - Britain's Richard Whitehead relished the feeling of running a marathon on the streets of London, seven months after the Paralympics at which his ambitions had been denied by the decision not to include a marathon in the programme. Whitehead, who assuaged his disappointment at London 2012 with a startling win in the T42 200 metres event, said the atmosphere at the 2013 Virgin London Marathon – where he was racing as part of the new programme incorporating the International Paralympic Committee's (IPC) World Cup event – had matched that of the previous summer. "It was an amazing buzz to be on the course today," said the 36-year-old double amputee, who races on prosthetic legs. "The reception I got from the crowd reminded me of the atmosphere when I won the 200m gold at the Paralympics. "This has been an amazing opportunity. "Now I'm looking ahead to the World Championships and the Anniversary Games in the Olympic Stadium. "Hopefully there will be 80,000 people in there like there were last summer." 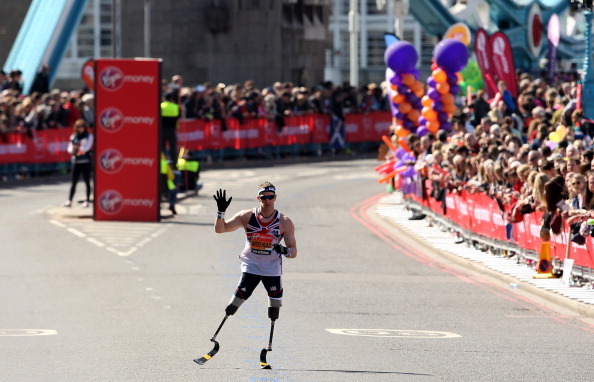 Whitehead, wearing a Union flag bandana, was characteristically exuberant as he completed the final stretch of the race, flexing his biceps and throwing salutes to the crowd before winning his T42 category with a time of 3 hours 15min 53sec. El Amin Chentouf of Morocco, winner of the London 2012 T12 visually impaired 5,000m title, was first IPC racer home, winning the T11-12 class in 2:24:00, inside the world record. 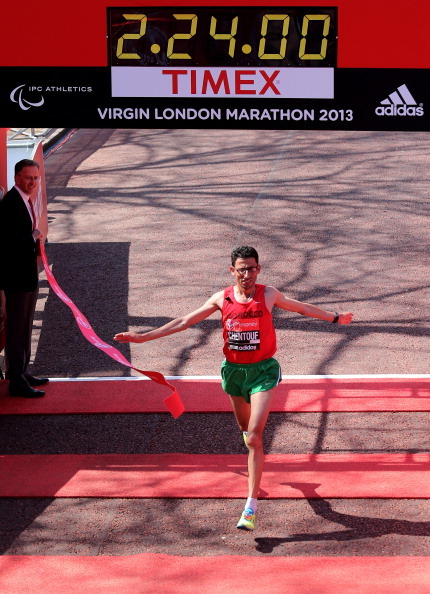 Abderrahim Zhiou from Tunisia was second in 2:28:12, with Portugal's Gabriel Macchi third in the category in 2:37:23. 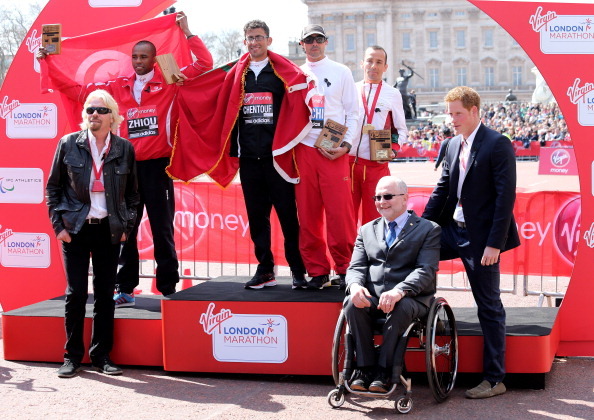 The podium after the inaugural IPC World Cup event at the London Marathon – (from left) Abderrahim Zhiou, El Amin Chentouf, Gabriel Macchi and Alessandro Di Lello, with a front row of (from left) Virgin boss Richard Branson, IPC President Sir Philip Craven, and Prince Harry. Spain's Maria Carman Paredes Garcia took the women's T11-12 title in 3:17:10. Alessandro Di Lello of Italy won the T44-46 limb impairment category - and was third overall - in 2:32:06 from Jose Antonio Castilla of Spain, 2:38:06, and Ozivam Bonfim of Brazil, 2:39:23. It was a highly satisfactory spectacle for the attending IPC President, Sir Philip Craven.